CyberPower one of the greater manufacturer of gaming desktops and laptops recently introduced a series of Gaming Desktop PCs that features nVidia 3D Vision.The Desktop PCs includes Gamer Xtreme 3D 3000, Gamer Xtreme 3D 2200, Gamer Xtreme 3D 2000, Gamer Xtreme 3D 2500, Gamer Ultra 3D 1500, and Gamer Ultra 3D 1000. 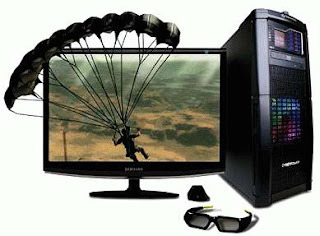 All the above CyberPower 3D Vision Gaming Desktop PCs comes bundled with 3D Vision Stereoscopic Glasses and Samsung 2233RZ 22-inch 3D-ready LCD display.The new CyberPower 3D Vision-Ready gaming desktop PCs are powered with either AMD and Intel processors with two, four and six cores. 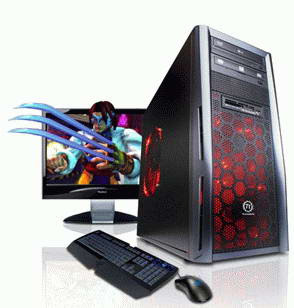 Other features that comes included with CyberPower Gaming Desktop PCs includes support for up to 24GB of RAM, up to 2TB hard drive, up to two optical drives including Blu-ray and a solid state drive as optional.The 3D Vision Desktop PCs also houses a GeForce graphics card with DirectX 10 API or DirectX 11 with an option of up to GTX 480 with 1.5GB of memory. The all new CyberPower 3D Vision Gaming Desktop PCs will be available with a price tag that starts from $1290 onwards. Tags:-3d pc, 3D Vision, 3d vision gaming pc, CyberPower Gaming Desktop PCs,3d vision pc, Cyberpower, cyberpower 3d pc, cyberpower gaming pc, cyberpower pc, Desktop, nvidia 3d vision, CyberPower 3d vision gaming pc, CyberPower 3d vision gaming pc price, CyberPower 3d vision gaming pc features, CyberPower 3d vision gaming pc details, CyberPower 3d vision gaming pc specifications, CyberPower 3d vision gaming pc availability.